The electric automatic water make-up system is a simple and highly functional and reliable design. 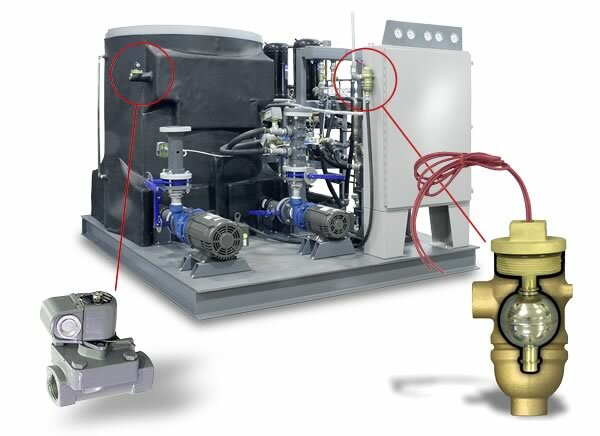 The system has two components, the make-up solenoid valve and the float level switch. The Float Level Switch is mounted on the control cabinet (if purchased) and monitors the water level in the reservoir. If the water level falls below the float, the Make-Up Solenoid opens, allowing water from the plannt's supply source to flow into the reservoir. The solenoid stays open until the water level inside the reservoir rises to the float switch level. The electric automatic water make-up system is available on Advantage pump tank stations and central chillers using the Tough Tank ™ brand polyethylene reservoir. For more information about water make-up for process cooling systems call the Advantage Sales Department at 317-887-0729. Would you like to Download FYI #243 to your browser?